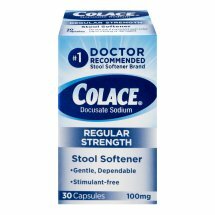 Colace Stool Softener 100 Mg - 30 CT.
Colace�� Stool Softener 100 Mg.
#1 Doctor recommended stool softener brand. Uses: Relieves occasional constipation (irregularity). Generally produces bowel movement in 12 to 72 hours. Each capsule contains: sodium 5 mg very low sodium. Retain this carton for important information. Active Ingredients: In Each Capsule: Docusate Sodium (100 mg). Purpose: Stool Softener. Inactive Ingredients: D&C Red 33, FD&C Red 40, FD&C Yellow 6, Gelatin, Glycerin, PEG 400, Propylene Glycol, Sorbitol, Titanium Dioxide.